Have peace of mind and take control of your life! 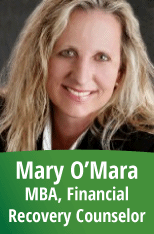 Mary is a certified Financial Recovery Counselor℠ with extensive coaching and financial counseling experience. Her depth of knowledge around financial well-being and connecting her clients with their monetary values is only part of the journey in which she supports her clients to financial recovery. She has helped many individuals, couples, and families overcome financial challenges to achieve successful outcomes. Mary also hosts classes for young women to gain financial knowledge.